It’s coming to the end of another year. 2013 has certainly been interesting for me. I graduated and then decided to return to University to study for a Masters. I did some travelling, and had a lot of laughs as well as a few tears throughout the year. The thing is though, how can you remember every single good thing that happened in 365 days? Yes you can keep a diary but a diary is for all our thoughts and feelings, both the good and the bad – I for one always seem more inclined to put my thoughts down on paper when it’s something bad as it helps me work through it than something good, so it’s quite easy to focus on the bad. This is where my “Good Things Jar” came in. It’s a simple idea really that I saw floating around the internet this time last year. Take a jar (or any type of container really) at the start of the year and when something good happens write it down on a piece of paper, put it in the jar and watch the good things grow. When it is New Year’s Eve open that jar and have a read through of all the good things that happened to you that year and smile and remember. This is my jar. As you can see I decided to stick stickers on it (maybe next year I’ll cover it completely) The different colour paper inside doesn’t mean anything, it was just whatever paper I had to hand, but I do like how there are different colours in my jar. In total I had 34 pieces of paper so 34 good things happened to me in 2013 that I wanted to make a note of. When reading them for the first time today since I wrote them I had to smile as some of them really are quite mundane in the grand scheme of things. That being said, it’s good to remember the little moments. – Got a First for my dissertation. – Saw both Imagine Dragons and OneRepublic live. Both were amazing. – An essay on African American Literature was remarked and went from a C to a B. – Watched the Graham Norton Show live. There was Steve Carell, Josh Groban, Kristen Wiig and Chris O’Dowd. – Met Dexter Fletcher (twice). – Fun nights out down the pub. – Got an A for my first piece of MA coursework. – Nice comments made by employers. – Won free preview tickets to different films including The Secret Life of Walter Mitty, Welcome to the Punch and Blue Jasmine. – Got a Bronze award for giving blood ten times. – Travelled around Italy for over two weeks. – My lecturer tried to convince me to do a PHD as she thinks I’m good enough. – Received some lovely text messages that made me smile and feel loved. 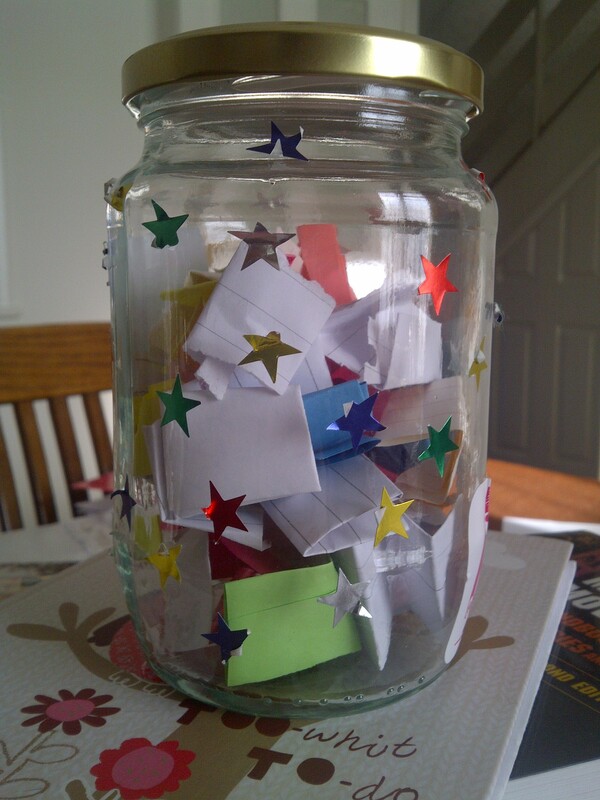 I’ve now emptied my jar, though I am keeping the notes in a small envelope labelled 2013 for future reading, and am ready to start afresh in 2014. I’m looking forward to seeing what this year brings. ← Zorro Reborn – a more original reboot/remake?